I am loving all the new viewers lately, but am having troubles unrezzing and rerezzing over and over again, seriously it took me all day to get these pics, but totally worth it. I wish I knew that it was definitely SL being laggy or that it was the viewer, or what, because it makes it rather difficult to fix if you don’t understand the issue. Mind you some pics I took 7 times due to the distraction of Celebrity and Whimsy in conference, those two are nuts, but I love spending time with other bloggers while working, you talk, you take pics, you unpack bags, or just sit in silence but know you can just shout out or start muttering about whatever when you want, it is really nice :). The first dress I am wearing is so classy, reminds me of when I used to work, in the sense that it has a very professional look about it, and can be worn very simply or add accessories for a more put together look. Me myself would have to add a safetypin just under the zipper pull on the inside of the dress, because way back in the 80’s I had a dress with a front zip and let’s not go there with that story. The long pulled back ponytail is another win from Raw House, the tail is extra long but not so full as to be messy. A sophisticated tail for people to wear working. The pigtails however are fun fun fun, so fun in fact that this version have the texture change option on the front side tendrils, and I had a lot of fun mirroring myself with them. You will also notice my beautiful silver jewelry from MOOD, they have such a great arrangement of items, and this set is one of those ones that you can wear casual or dressy, because it just has that oversized silver chunka chunk fabulousness to it. Kicking it military style with the top and pants from L’Abel as well, the look is fun but still can be work wear if you were to add a layer underneath, to cover up that expanse of tummy. Lassitude and Ennui are responsible for the boots and they are divine, I can see these being the crossover boots that go from RP to mainstream fashion with ease…Lassitude has always been that way though, and I for one am glad to see they seem to be releasing more regularly of late. LeLutka just this past day or so released the Gem skin, a more mature older sister if you will to Kit. The release is sold differently than in the past, and for those on a budget, you will love. The skin itself is done in two different packs, a base skin with four other made up skins – as well as curl lashes, cleavage, hair base and brows in dark and blonde and eye bags. Then you have the option of enhancing them with seperate purchases of lipsticks, liners and lashes. The liners I have only shown one of in the lipsticks pic which is the bottom one, and only showing half the lipsticks. WIth there being 12 in the pack though adding that to your base skins and four made up looks in one pack, you end up with a further 60 looks from the one pack. 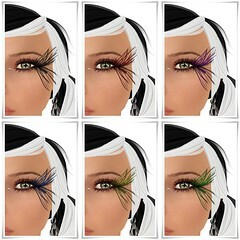 The liners come in four colours and each of the Feather Lashes and Facial Gems are texture change, so again more and more and more looks. With the right kind of viewer you can even add attachments not just more tattoo layers, so you can combine gems and feathers and regular sculpted lashes, as done in the main pics and such an awesome look. So DEMO DEMO DEMO Gem and you just have to partake in some of the Gems and Feather lashes because they are so awesome and the price is crazy low.